Simulation of urban mobility (SUMO) is a simulation framework and open GL GUI based open source. We implement this simulation framework to deal large number of nodes in Vehicular Ad-hoc Network. We offer SUMO academic projects to evaluate traffic model utilities for road networks, traffic demand generation and routing utilities. We describe sumo as supporting tool for find route, visualization and import network and emission calculation. We can enhance various models and ensure various API for simulation control. Multimodal traffic simulation such as vehicles, pedestrians. Network size and simulated vehicles are not limited. It implemented in C++ and use portable libraries. Vehicle, pedestrians are modeled explicitly. Support format such as VIsum, VISSIM, NavTeq, openstreetmap. Traffic light scheduling is generated by SUMO. JTRROUTER: Generator Router based on turning ratios at intersections. DFROUTER: Generator Router with use of Data detector. 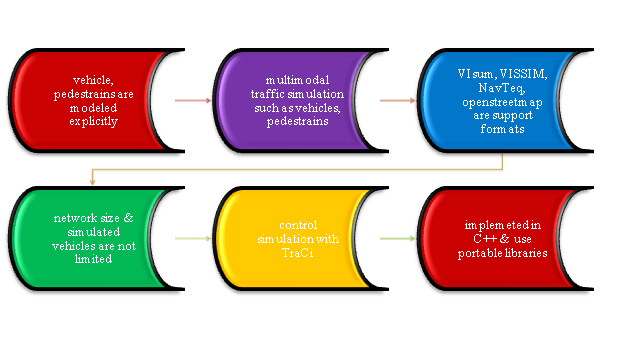 GUISIM: Simulation with graphical user Interface. DUAROUTER: Generator Router based on Dynamic user assignment. MAROUTER: macroscopic user assignment based on capacity functions. OD2TRIPS: O/D matrices to trips converter. We offered and implemented sumo in more than 75+ projects for various applications and to perform simulation in traffic scenario. Car-Following and Lane Change API. Evaluation of Traffic Surveillance Systems. Route Choice and Dynamic Navigation. Model are extended for noise emission and used for fuel consumption and pollutant emission. Collect emission and fuel consumption over the vehicles and to write values into file. It is used to expect simulation in ongoing urbanization and increase environment concerns. Various trends are improved by SUMO.